Without Box - $20 per pc (Free normal postage only) Out of Stock! Enquire stock availability now! 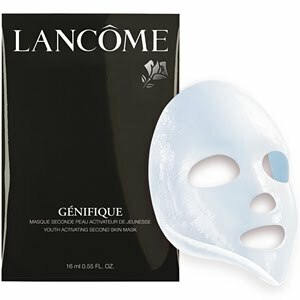 Indulge in this mask twice a week to get the concentration of the one-of-a-kind Complex contained in a whole bottle of Génifique Youth Activator. Patented actives to revive the activity of genes and stimulate the production of your proteins. Thanks to its pioneer bio-technology active texture, the fresh bio-cellulose mask seamlessly adheres to your face's contour like a second skin. So powerful that 100% women experience a visibly more radiant, refined and re-plumped skin. This mask promises results equivalent to 7 days use of Genifique in just 1 application.